Growing up in my Italian family, pasta was frequently on the menu – its deep in my bones. There is nothing more comforting than a bowl of mum’s homemade tomato pasta sauce (yep, we used to eat it like soup it is that good!). These days I am gluten free and pasta is cooked less frequently in our home but I promise, the appreciation is still there. As humans, we are creatures of habit. We all have that go-to pasta recipe and while pasta is often cooked as the easy option, the weeknight option – it isn’t always the veggie-packed option. What I love about this recipe is how simple it is.. you can even roast the pumpkin beforehand so it is ready to go. You can add in pretty much any other veggies you like for added nutrients and it tastes pretty good the next day as leftovers. The pasta I grew up on was in a blue box, the number 9, thin and perfectly round pasta, that would pair perfectly with any sauce or recipe. These days, I am gluten free and always on the hunt for delicious, healthy and additive free pasta that brings that same delicious element. I personally perfect to avoid corn pasta and rice pasta as they tend to fall apart (I don’t love the idea of eating lots of corn, but that topic is for another time), I love buckwheat pasta and have fallen into a deep deep love affair with San Remo’s Pulse Pasta – I am not affiliated in any way. 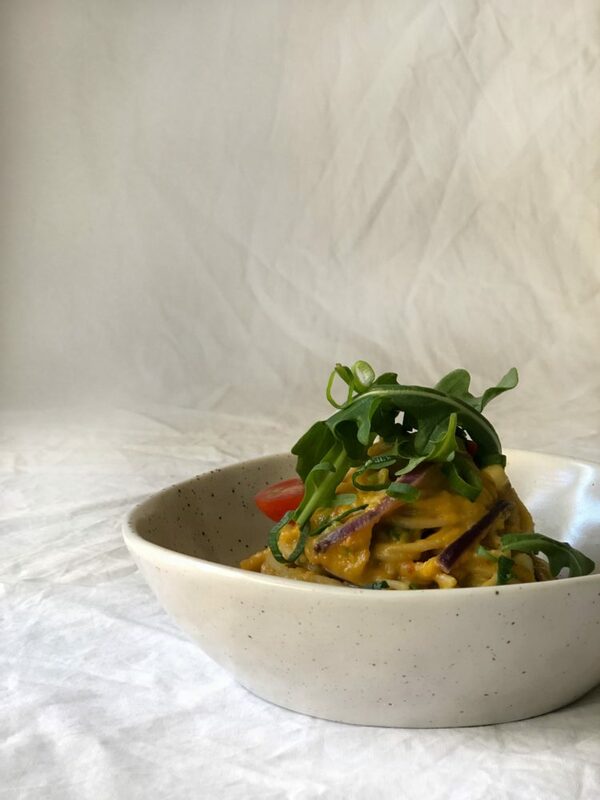 The Pulse pasta has a much higher fiber and protein content as it uses legumes, this means that it also has a lower GI (Glycemic Index) to wheat alternatives. In a medium pan, saute the garlic, onion and sage leaves in a little olive oil or butter until soft and delicious. set aside in a little bowl. Add roasted pumpkin to the pan with 1/4 cup of almond milk. cook through and use a stick blender or potato masher to create a puree. This can also be done in a blender. Once pumpkin puree is delicious, add back in the garlic and onion mixture, as well as sundried tomatoes, chili, salt and pepper to taste. simmer on a low heat, adding in extra almond milk as needed to thin the sauce. You want the consistency to be similar to a pesto. While this is happening place a pot of water to boil and cook your pasta as per the directions. Once pasta is cooked, drain water and add pasta into the sauce. mix well to combine. Add in the rocket, fresh tomatoes, and any other yummy ingredients you have the in the fridge.